The next morning everyone woke up early to have breakfast together with Tok Abah before he went off to work at 8.30am. After breakfast, Mommy, Tok Mama and I went back to the room and I fell back to sleep soon after. Our original plan was to go for a swim at the pool but it was raining so we had to cancel our plan. At Wan Ani's house upon arrival. I can't sit still as usual! Mommy, can we go out now?? Yeaaayy! I'm ready to leave my hotel room & explore Kota Bharu! At around 2pm, the three of us decided to browse through the shopping mall next door which was connected to the hotel. We bought some snacks and headed back to the room. Tok Abah came back at around 4pm. At 6pm, Tok Mama's friend from school, fetched us from the hotel and took us to her house for dinner. We had typical Kelantan food called Laksam and Laksa Kelantan. I had some of Mommy's, some of Tok Mama's and some of Tok Abah's. After dinner she sent us back to the hotel. We then drove to another shopping mall called KB Mall about 5 minutes' drive from the hotel and Tok Mama looked for some scarves for souvenirs. On the way back to the hotel, we had supper at a restaurant named Tarbush which serves Arab food. I love looking at myself through the mirror! Off to dinner! The red dress makes it hard for me to walk.. The next day, we didn't have breakfast with Tok Abah. After he left for work, we went down for breakfast at around 10am. Again, we wanted to swim but I started yawning right after breakfast so we didn't go and I went back to sleep. Tok Abah came back at 11am and they started packing. We were supposed to check out of the hotel at 12 noon but Tok Mama asked for a late check out. We eventually checked out at 2pm. We then headed straight to a place which sells Batik materials. We spent more than an hour there and finally drove to KB Mall right after for a drink because the weather was so hot, we wanted to look for air conditioned place. We were supposed to meet Wan Ani, Tok Amin who had just arrived that very morning and their kids at the restaurant, Tarbush for dinner. Look at all the colourful BATIKs.. Amazing! They arrived at around 7pm, we had dinner there and then headed straight to the airport with them. Our flight back was scheduled at 10pm so we had plenty of time. After saying our farewells, we went to the waiting area and Mommy gave me a quick shower and changed my clothes into fresh ones. Mommy, Tok Mama and Tok Abah freshened up too. Soon after, there was the announcement of passengers with babies to board the plane first. This time I was wide awake. Finally I experienced my first take off and enjoyed looking at the view very much. I was fascinated by the tiny lights below us. A short while after taking off the flight crews gave us cupcakes and juice which I shared with Mommy. The flight took us slightly less than an hour. I read some books Mommy brought along for the trip and when we finally landed we took turns getting off the plane and took some photos outside. We waited a while for our luggage and went out to wait for Dadda. This time, I will not miss the take-off! I'm soo excited, I can't sit still! When Dadda arrived he was happy to see me and asked how our trip was like. At home we showed him photos that we took during our trip while Tok Abah, Tok Mama and Mommy told him about the trip. 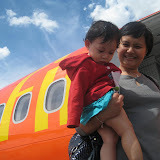 Mommy was especially happy with the flight because apparently, when she traveled with Dadda on a different flight (different company), the crews were very rude to her. Where as in this flight, the flight crews were very polite and were always smiling. Thank you Malaysia Airlines (i.e. FireFlyz) for the good hospitality! I'm sooo happy..! So, now you know how my first flight went. I'm definitely looking forward to more 'flying' trips! Here's the photo album for your viewing pleasure..
p.s; My entry for MAS The Great Escapade contest before didn't win me the trip, but I'm hoping to fly with Mommy & Dadda soon!